Piracy is funny when it involves parrots with risqué vocabularies, saying “Argggh” a lot, and Johnny Depp proudly debarking from his sinking jalopy of a raft. Piracy is deadly serious when it is a form of terrorism in which routes of commerce are disrupted, people die, and a sea captain in Swiss Family Robinson makes his granddaughter dress like a boy to protect her from…well, I could never figure out from what when I was eight years old. But something really, really bad. In honor of International Talk Like a Pirate Day this coming Sunday (September 19th every year), here are some resources for learning about the not-so-funny legal aspects of piracy. 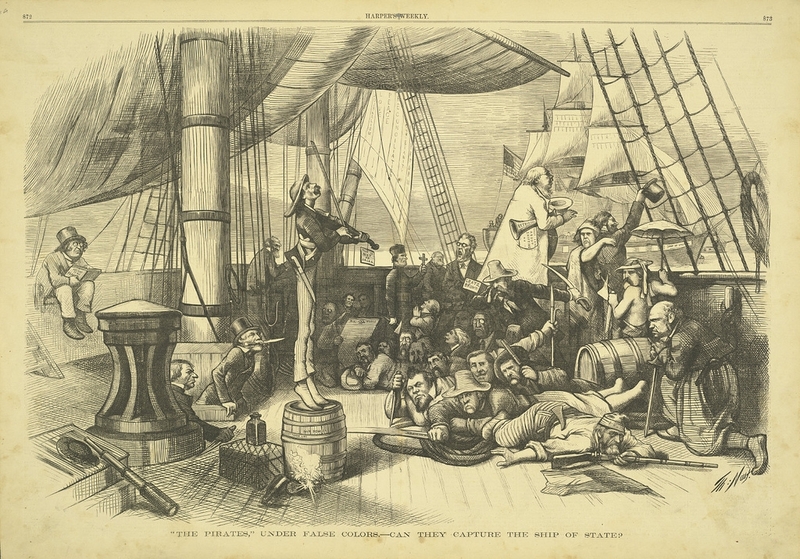 The Law Library of Congress has digitized this collection of 57 works about piracy that range in date from 1696 through 1905. These accounts, many of them melodramatic retellings of attacks by pirates, trials, and executions, provide an interesting look at piracy in the Western Hemisphere. Learn more about this collection from InSITE, Cornell Law Library’s review of free legal Web sites. The Louisiana Works Progress Administration Collection provides public access to this collection about piracy in New Orleans history. The Law of Piracy. Alfred P. Rubin. 2nd ed. Irvington-on-Hudson, New York: Transnational Publishers, Inc., 1998. Law Library call number K5277 .R89 1998. This book traces the development of piracy and piracy law in the Greco-Roman world, England, and the United States. La Piraterie au Vingtième Siècle: Piraterie Maritime et Aérienne. Corinne Touret. Paris: Librairie Générale de Droit et de Jurisprudence, E.J.A., 1992. Law Library call number K5277 .T68 1992. This book takes an international law approach. Patriot Pirates: The Privateer War for Freedom and Fortune in the American Revolution. Robert H. Patton. New York: Pantheon Books, 2008. Olin Library call number E271. P27 2008. Patriot Pirates describes of the history of American colonial privateers during the Revolutionary War (like Rhett Butler in Gone with the Wind, except in a different war), their motivations, and the questionable legality of their actions. Is the Crime of Piracy Obsolete? Edwin D. Dickinson. 38 Harv. L. Rev. 334 (1925). The Charge of Piracy in the Spanish Civil War. Raoul Genet. 32 Am. J. Int’l L. 253 (1938). Note: Towards a New Definition of Piracy: The Achille Lauro Incident. George R. Constantinople. 26 Va. J. Int’l L. 723 (1986). Terrorism on the High Seas: The Achille Lauro, Piracy, and the IMO Convention on Maritime Safety. Malvina Halberstam. 82 Am. J. Int’l L. 269 (1988). The New “Jamaica Discipline”: Problems with Piracy, Maritime Terrorism and the 1982 Convention on the Law of the Sea. Samuel Pyeatt Menefee. 6 Conn. J. Int’l L. 127 (1990). Comment: International Law of the Sea: Reconciling the Law of Piracy and Terrorism in the Wake of September 11th. Tina Garmon. 27 Tul. Mar. L.J. 257 (2002). Comment: Pirates, Then and Now: How Piracy Was Defeated in the Past and Can Be Again. Max Boot. 88 Foreign Aff. 94 (2009). Comment: Blackbeard Meets Blackwater: An Analysis of International Conventions that Address Piracy and the Use of Private Security Companies to Protect the Shipping Industry. Jill Harrelson. 25 Am. U. Int’l L. Rev. 283 (2010). The U.S. State Department’s travel warnings for countries affected by piracy is available here. Resources from the Council on Foreign Relations include articles and an interview with an International Affairs Fellow, which is also available as a podcast. View world shipping traffic, including cargo, cruise, tanker, and pleasure ships, in real time with MarineTraffic.com’s interactive map. There is a good bibliography of additional piracy resources from the Asia-Pacific Center for Security Studies. Image: “The Pirates” Under False Colors-Can They Capture the Ship of State? from Cornell University Library’s Collection of Political Americana, available on flickr.com. To add to your list, the UN gave this subject much attention this summer and is considering, among other options, the possibility of creating a new international tribunal.